Passionate about woodwork from the age of 10, I trained in cabinetmaking at an art cabinetmaker. During this training I visited the school of violin making Mirecourt, and I was immediately seized with passion for instrumental work. Unfortunately I did not have the qualifications, not being a musician, to be accepted in this place. My apprenticeship ended, I first worked in the manufacture of furniture, then a wood carver, later in the interior layout, a little later in the furniture restoration of the 17th and 18th century and finally, in the design and production of contemporary furniture prototypes. In 2003, a friend gives me a guitar to repair which awakens in me the desire to learn to play. 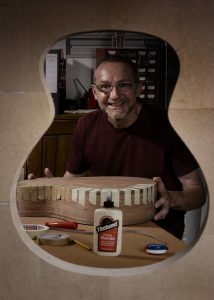 Encouraged and advised by renowned luthiers and guitarists, I created my company in October 2009. From the beginning, I have always tried to evolve my instruments so that they have a rich, balanced and powerful sound, but at the same time a guitar must be comfortable and adapt to the guitarist so that it can put all his energy and his art in his game so that he becomes one with his instrument.